This is NOT A NEW TAX and is NOT A TAX INCREASE! It is a RENEWAL of an existing 0.85 mill 5-year Permanent Improvement Levy. This same tax has been providing needed funds for 60 years (since 1959). 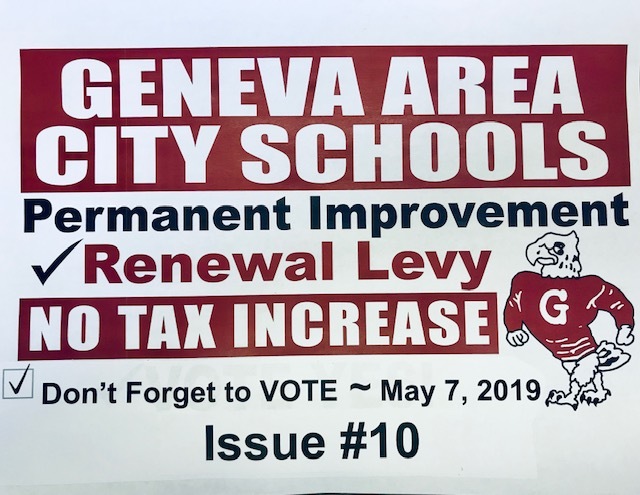 The Geneva Area City Schools must maintain over 81 million dollars worth of buildings and grounds. Keeping the school buildings in good condition and conducting preventative maintenance saves money and makes our community investment last longer. With the reinstatement of full bus transportation for the 2019 - 2020 school year, the funds permit the district to maintain a safe and efficient bus fleet for our students. This tax generates about $200,000 annually. The funds can NOT BE USED FOR SALARIES or other compensation. In the next five years , the funds generated by this important levy will continue to fund improvements like the items listed above in our district.